So I have been too busy celebrating my birthday for the past five days that I haven't really had the time to update my blog or do much else except sleep and pass out spontaneously. I can't believe I'm this exhausted (although I should've expected it) and I'll definitely be trying to catch up on my sleep this week after my two huge, group projects are over with by tomorrow. Luckily I found these outfit pictures that I never uploaded that I took in the very, very, very beginning of September. It's too cold to be bare legged these days and back when these pictures were taken Jeremy was still abroad (hence why I was still wearing his necklace as a bracelet). Thank you guys so much for all the happy birthday wishes and I'm still somewhat in denial that I'm 21. It just doesn't feel much different even though it does at the same time. I guess that's how birthdays work, yeah? Love the outfit! Perfect for fall. Happy birthday! :) I know what you mean about being in denial. I turned 21 this year, too, but it certainly doesn't feel like it! You look smashing!! That orange skirt is too cute. Glad to hear you had a fun week celebrating your birthday! This is such a cute outfit!! Great for any day. 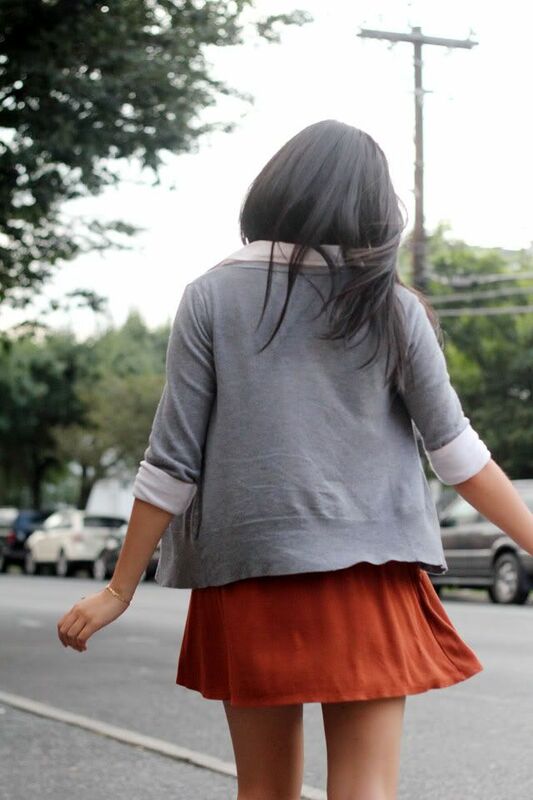 Love the cardigan and skirt. Hope you had a wonderful birthday! Light Conceal is an item that can be used by buckskin workers to create various types of buckskin shield. It is looted from Large Struggling Upper body. So...........this is going to be freaky but I posted on Monday too. AND I WORE. RUST AND GREY TOO! Weee! You look way better though :) Love this whole outfit! <3 Happy blogversary! That means mine's coming up soon too! Ah!